In this highly anticipated new novel, Irishman Jack McNulty is a "temporary gentleman" - an Irishman whose commission in the British army in World War II was never permanent. Sitting in his lodgings in Accra, Ghana, in 1957, he's writing the story of his life with desperate urgency. He cannot take one step further without examining all the extraordinary events that he has seen. A lifetime of war and world travel - as a soldier in World War II, an engineer, a UN observer - has brought him to this point. But the memory that weighs heaviest on his heart is that of the beautiful Mai Kirwan, and their tempestuous, heartbreaking marriage. Mai was once the great beauty of Sligo, a magnetic yet unstable woman who, after sharing a life with Jack, gradually slipped from his grasp. Award-winning author Sebastian Barry's The Temporary Gentleman is the sixth book in his cycle of separate yet interconnected novels that brilliantly reimagine characters from Barry's own family. The information about The Temporary Gentleman shown above was first featured in "The BookBrowse Review" - BookBrowse's online-magazine that keeps our members abreast of notable and high-profile books publishing in the coming weeks. In most cases, the reviews are necessarily limited to those that were available to us ahead of publication. If you are the publisher or author of this book and feel that the reviews shown do not properly reflect the range of media opinion now available, please send us a message with the mainstream media reviews that you would like to see added. Readers familiar with Barry’s work will appreciate the mention of many characters recognisable from his other works about this family, although some have different names. A bit of background knowledge of the Troubles in Ireland is also helpful, as much of the novel is set against this background. As Jack finally admits his responsibility for certain heart-breaking events of his past, Barry adds another layer to the engrossing McNulty history. Readers are once again treated to the wonderful descriptive prose of which Barry is a master: “We could see the coast of Africa lying out along a minutely fidgeting shoreline. The only illuminations were the merry lights of the ship, and the sombre philosophical lights of God above. Otherwise the land ahead was favoured only by darkness, a confident brushstroke of rich, black ink” and “A lark, a single bird with her dowdy plumage, burst up from her cup of sand just in front of me and like a needle flashing in my mother’s hand of old made a long stitch between earth and heaven, with a joyousness that rent my heart” are just two examples. 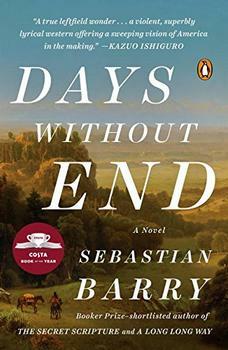 Both beautiful and sad, this is another brilliant read from Sebastian Barry. Sebastian Barry was born in Dublin in 1955 and educated at Trinity College, Dublin. Academically, he has held posts as an Honorary Fellow in Writing at the University of Iowa (1984) and Writer Fellow at Trinity College, Dublin (1995-96). His early plays include Boss Grady's Boys (1990) and The Steward of Christendom (1995), Our Lady of Sligo (1998) and Hinterland (2002). Whistling Psyche (2004), and The Pride of Parnell Street (2007), are two interweaving monologues. His latest play is Tales of Ballycumber (2009).